Yet again, Michael J Malone has written a complex and compelling domestic noir thriller with a social conscience. Paula is grieving after her husband Tommy's sudden death. Without any close family of her own, she has very few people to give her any support. Tommy's death brings back memories of their son Christopher's death, seven years earlier, which led to her and Tommy growing further apart. Yet despite all of this, Paula believes they had a good marriage without any secrets. It's only when a young woman, Cara, approaches her after the funeral that Paula wonders how well she really knew her husband. After He Died kept me entertained from beginning to end. Michael J Malone gets right into the heads and hearts of all of his characters, particularly Paula and Cara, with chapters switching between the two. I felt like I was feeling Paula's emotions alongside her, experiencing her pain and anger, confusion and fear. I was just as intrigued as she was to find out what (if anything) Tommy had been up to behind her back. There is so much bubbling under the surface in After He Died. 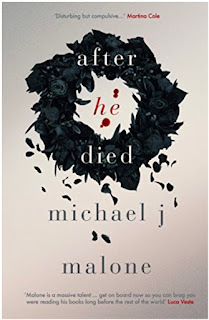 Just when I thought I had it sussed, Michael J Malone threw something else into the mix. The suspense escalates until the final crescendo - as all of the strands come together, Paula's world falls apart and things turn much more sinister. A reminder that we don’t always know the ones we love as well as we think. There are also some powerful social messages here. An insight into independent advocacy services created a sense of realism and kept the plot grounded. It provided a deeper understanding of inequality and the social divide, and how some people help to make the world a better place for those in need. After He Died is a thought-provoking read - well researched, well written and well done!